Couch potatoes could soon be turning on their TVs, activating their answering machines and automatically ordering takeaways - simply by settling down on "smart sofas". Dublin scientists have shown off the latest thing in "intelligent furniture" that could be heading for hi-tech homes of the future - a comfy couch. 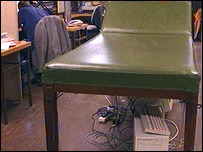 Programmable microchip sensors connecting the sofa's legs to a computer work out who is sitting on it by measuring their weight. Scientists also hope the sofa will benefit the sick or infirm. It is able to give a verbal welcome and switch on household appliances. Dr Simon Dobson, of Trinity College, told BBC News it could be programmed to automatically wake patients lying in particular positions. 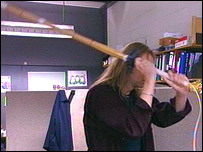 The scientists are also developing sports equipment that provides critical analysis of technique. 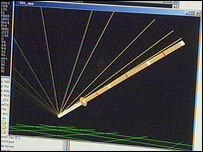 Mads Haahr, of Trinity College, told BBC News his "sensor-augmented" martial arts sword could automatically produce a computer graphic showing its movement and give performance feedback in the form of vibrations or sounds. Carol Gibbons, of Enterprise Ireland, said the smart products were "on track for commercialisation" and would give the sponsors "tremendous value". The Smart-Its Project - a collaboration between Lancaster University and several other institutions in Zurich, Germany, Sweden and Finland - aims to make almost any household object smarter. Bookshelves could start complaining if they are dangerously overloaded, water bottles will say if their contents need cooling and bathroom cabinets could issue verbal warnings when medicines pass their use-by dates. At a computer graphics exhibition in the US, researcher Martin Strohbach, told the BBC World Service's Go Digital programme: "We have used a table as a mouse pointing interface so you can control the TV or computer. "It could be used in caring for elderly people. "The sensors would recognise if they have fallen on the floor or can't stand up anymore. "It is much less intrusive than cameras." The chips have already been developed for DIY flatpacks. Green and red lights on the various components sense movement and light up to let you know if you are attaching a chair leg to the wrong bit. A Dalek-like voice will embarrassingly inform you of your error before you make any permanent mistakes. But it remains to be seen if DIY enthusiasts prefer the blood, sweat and tears of trial and error. "It's a sofa, but not as we know it"